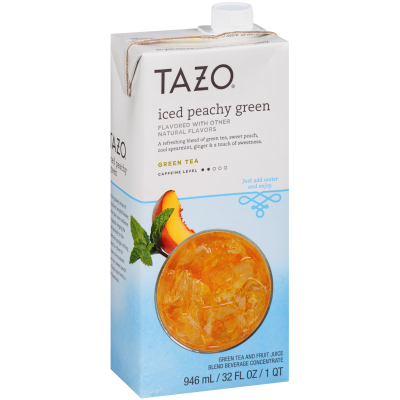 Satiate your guests' craving for something out of the ordinary with Tazo Peachy Green Iced Tea Concentrate. This premium iced tea concentrate requires no brewing and is made with an artful, imaginative blend of bright green teas, sweet peach, cool spearmint, ginger, and a touch of sweetness. This slightly sweet tea concentrate also allows you to easily expand your beverage offerings to include creative drinks like green tea lattes, peachy green tea coolers, tea cocktails, spritzers, and more. Whether you're an office manager looking to ignite the creativity of your workforce, or a café owner in search of a deliciously unique flavor offering, you will love serving this beverage that inspires joy and wonder with every sip.